Materials: Cream/vanilla painted brass scissor. 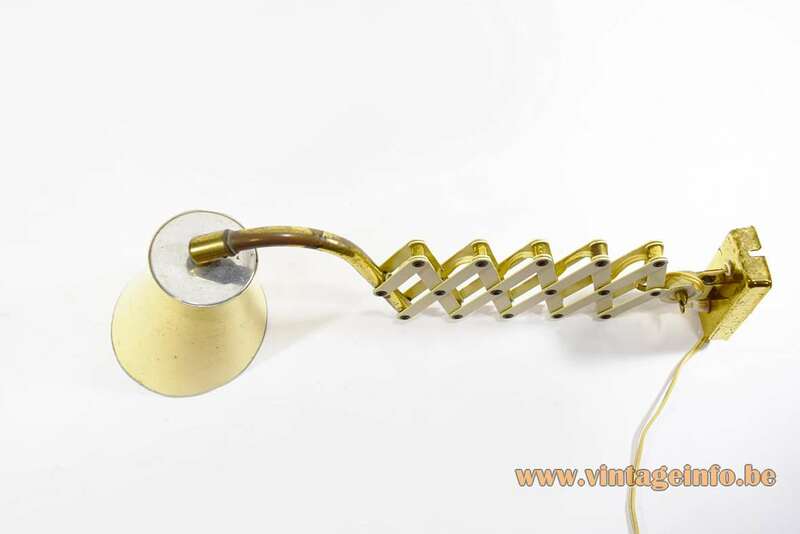 Brass pleated rod. Brass wall mount and parts. 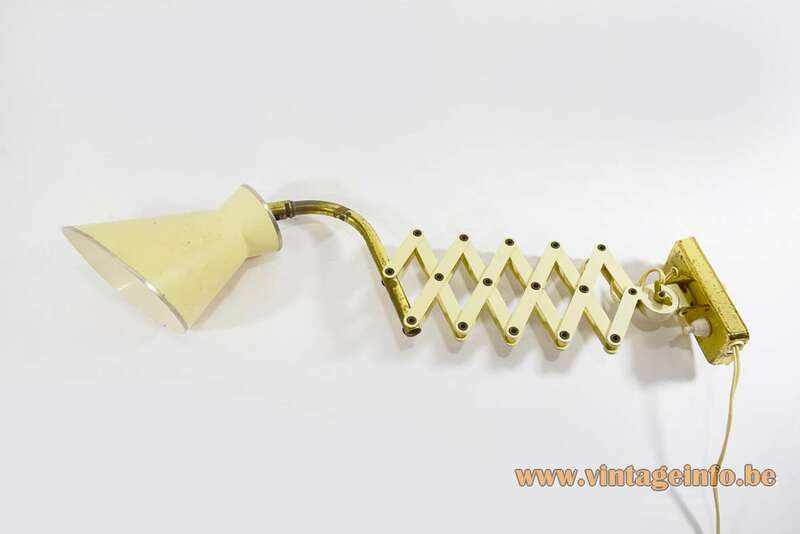 Cream/vanilla painted aluminium ”diabolo” lampshade, white painted inside. Any type of light bulb can be used, preferably a small one. Manufacturer: ERCO GmbH, Lüdenscheid, Germany. Other versions: Made in several colours. 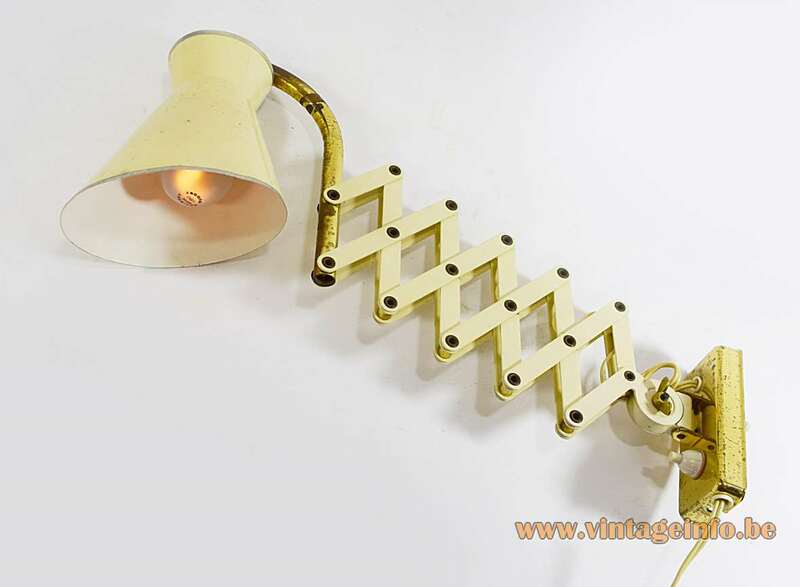 Some wall lamps have different wall mounts and they also exists in a version with a gooseneck instead of a brass rod on the lampshade. 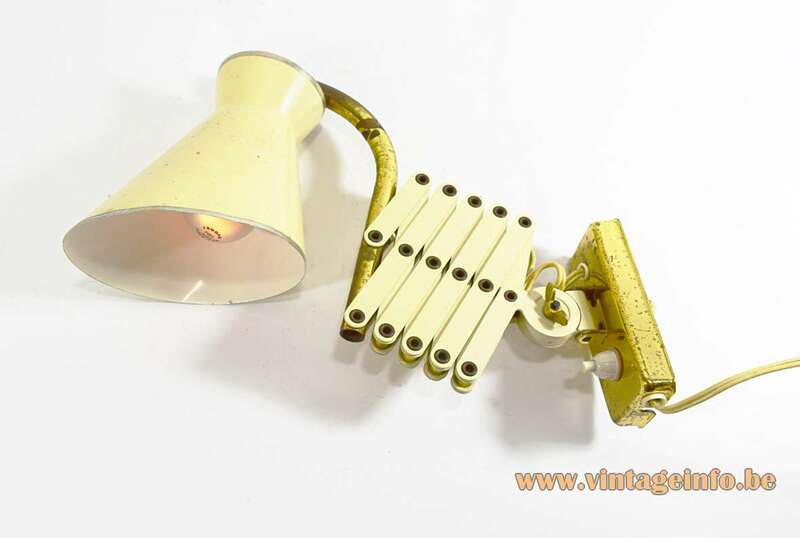 Also produced as a clamp lamp, a topical ERCO clamp. Often attributed to Hala, The Netherlands. Others say ANVIA, The Netherlands. 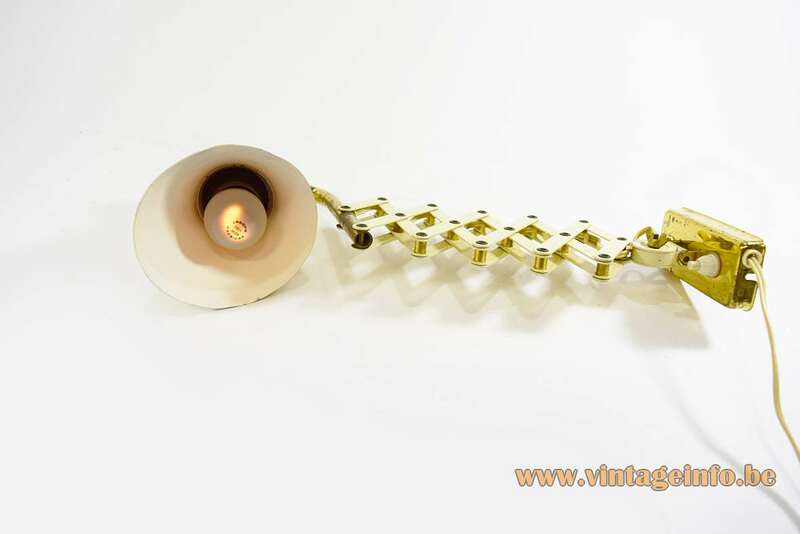 Some others say that it is a lamp made by the Italian Stilnovo company, but it is not true. ERCO was founded in 1934 by Arnold Reininger (1907-2003), Karl Reeber and Paul Buschhaus in Lüdenscheid, Germany. The company name ERCO represents a phonetic abbreviation of the founding name “Reininghaus & Co.“. The company is still in family ownership. 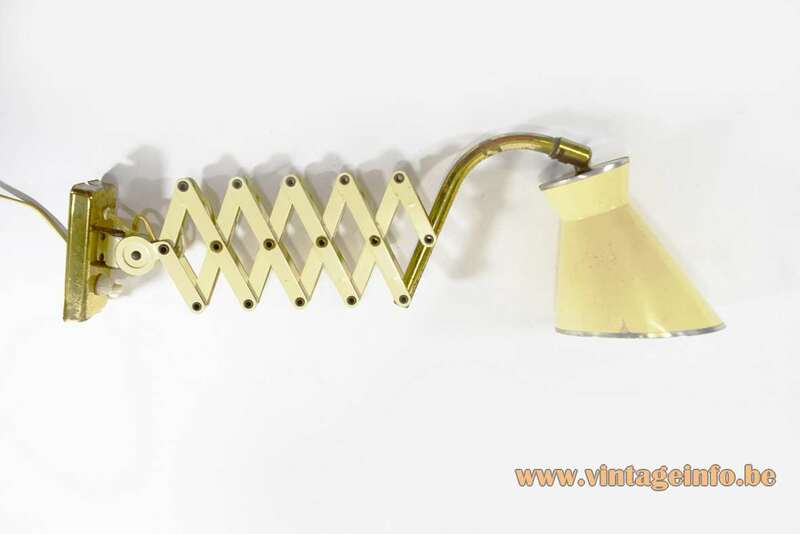 During the early years, ERCO produced parts for lamps. In particular a spring-supported retracting mechanism for hanging lights. In the 1930s the industrial production of complete luminaires was started. After the Second World War Arnold Reininger and Karl Reeber continued the company, co-founder Paul Buschhaus had died in the war. Famous designers that worked for the ERCO company are Alois Ferdinand Gangkofner, Roger Tallon, Ettore Sottsass, Emilio Ambasz, Shiro Kuramata, Giancarlo Piretti, Dieter Witte, Yves Béhar, Knud Holscher, Franco Clivio, Naoto Fukasawa and many others. The company was awarded many times thanks to these great artists and the vision of the ERCO company. ERCO received 88 iF Design Awards.